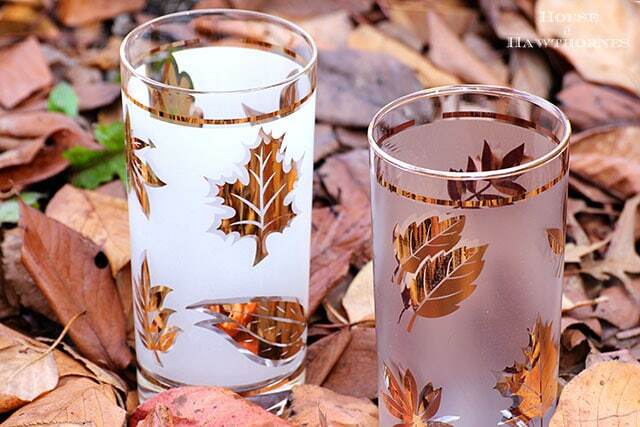 What would be more perfect on the Thanksgiving table than a set of vintage Libby Golden Foliage glassware? This is my MIL’s set and included a carrier, ice bucket and 7 out of 8 glasses. Since she was married in the late 1950’s, I think this may have been a wedding gift. It has a very mid-century Mad Men look to it. One pine cone or two? And you know what? I see this stuff at thrift stores ALL THE TIME! As a matter of fact, when I was out at my local thrift store this week I picked up a matching glass to round out the set. I was all excited until I brought it home and realized that it had a different level of frosting on it. Plus it has a gold rim around the top where the other ones do not. The glass from my MIL’s set it on on the left and the impostor is on the right. Close enough for me though. Once you’ve had a few highballs, no one will notice. Up until maybe six months ago, I thought this set was hideous. I hid it in the cabinet over the fridge that no one ever goes in to. You know, the cabinet that you have to climb on a chair to reach. The only reason I still own it is that it was my MIL’s and one of the few things my husband wanted to bring here when we sold her house. But recently I have come to LOVE a touch of mid-century here and there throughout my house. 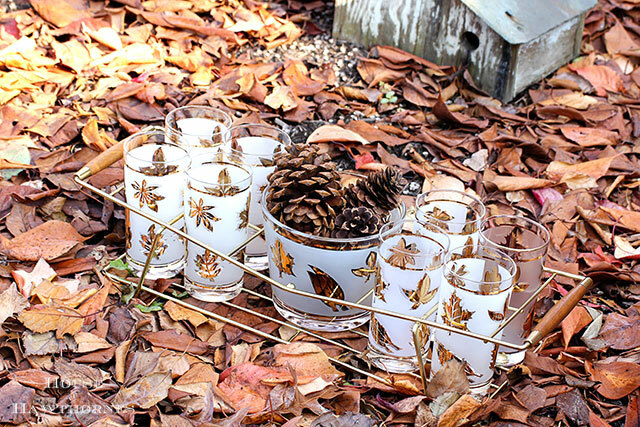 So if you want to dip your toes into mid-century or are just looking for the most perfect set of Thanksgiving glassware out there, run to your local thrift and see if they have any of these in stock! welcome to the world of mid century, it’s a whole new love & one that i am trying to incorporate into our french country home. it’s a delicate process but lots of fun! I’ve always loved mid century. We have a fair bit of it around the house. The one thing I like about having moved to OH? The fact that mid century remains greatly under appreciated in these parts. This means you can still find goods deals and it often gets overlooked by other shoppers. I’m always the weird one carting off the crazy chairs at yard sales! Back East the prices on this are SO much higher. When I first started thrifting and collecting, I purchased many glasses from this set. I have all different sizes as well as the ice bucket. I never realized how perfect they are for Thanksgiving. Thanks for the tip! funny you should you should mention this… i have started looking around my 96 year old grandma’s house and have really come to live her 1950’s pieces! she has a credenza like the one above! Mid century glasses have always held my fasination, but that seems to be all that I like from the era. I’m normally an eary century type of girl. I would love to get my hands on a set of christmas glasses however. I’m always on the lookout for them. The thing I’d really like from that era is my old body back…..
Our tastes change. I was born mid century and loved everything newer and more modern….until I got a little older! Now I love the things of my youth! Wonderful set, and so perfect for Fall. There is something great about the furniture from that era. I remember the ‘blond’ furniture that my grandma had. Wish I had it now…. This is odd, but I love that chair! I visited a friend last week that went all retro on her furniture and I loved the clean lines! My grandparents had these same glasses in their liquor cupboard. It was always a special treat when my sister and I could have a shirley temples in them. Cheers! My moom had these and may still. I didn’t like drinking out of them because of the frosted part. Love the Libbey glasses….the furniture, not so much. I do appreciate the clean lines, though! Love mid-century! I have a (repro) diamond chair. Usually that style has great design. Form follows function, you know. I have some glasses with a carrier that are very similar to these. I got them from my mom who got them from my grandma who always as long as I can remember had them in her special dishes cupboard with sliding glass doors. They have grown on me too. Great idea to use them for Thanksgiving and I will be doing that. Happy Thanksgiving! I know exactly what you mean about suddenly liking mid century items. Maybe we just needed to see how cute they are when displayed or used. I’m kicking myself that me or my husband didn’t take quite a bit of my MIL’s stuff. My daughter took them to store in her garage. About 6 months later I got to thinking about some of the things, the set of colorful aluminum tall tumblers, a clear glass 2 pc chip and dip set with a kind of Ad Men type sputnik design in gold on the two bowls, and some other items. I almost cried when my daughter said they were tired of storing them so …they..had..thrown..them..out.:((((((((. I don’t know what I was thinking not to have taken them into our house in the first place. Where was my brain? Anyway, I really like your set of glasses. I haven’t had the midcentury modern bug. Not sure if I ever will. But like you, I might be able to own a piece or two. Oh my gosh…we had these glasses when I was growing up. I have no idea what happened to them…probably sold in a garage sale. Very fun post! 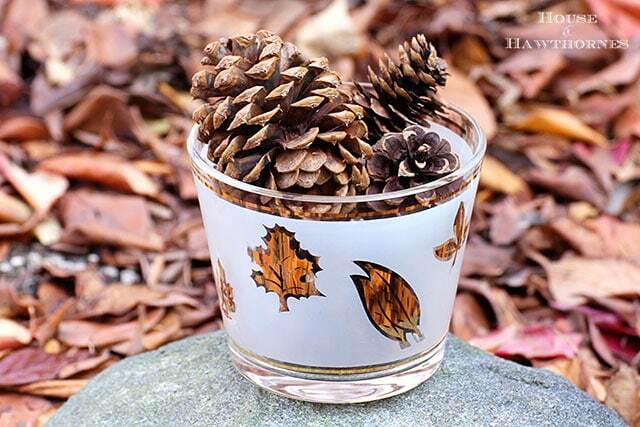 Those glasses are just perfect for Fall-Winter use. Like you, I am also beginning to appreciate the clean lines of mid-modern style. I would love to include some pieces in my decor! Don’t quote me on this. Next year I’ll probably pick up a piece on the side of the road. Not much into mid-century though. I love that ice bucket. If I find a glass like that in my thrifting excursions, I’ll get it for you! I have always been drawn to the mid century clean straight lines. Not that I have a house full of it-I have a lot of different pieces. Kind of antique eclectic I guess. the house I live in is mid century. I suppose that is enough in itself. My parents received a similar set for their wedding in 1959. I’ve always liked it. There’s a silver version as well.